PennsylvAsia: Squirrel Hill Magazine profiles Chaya. 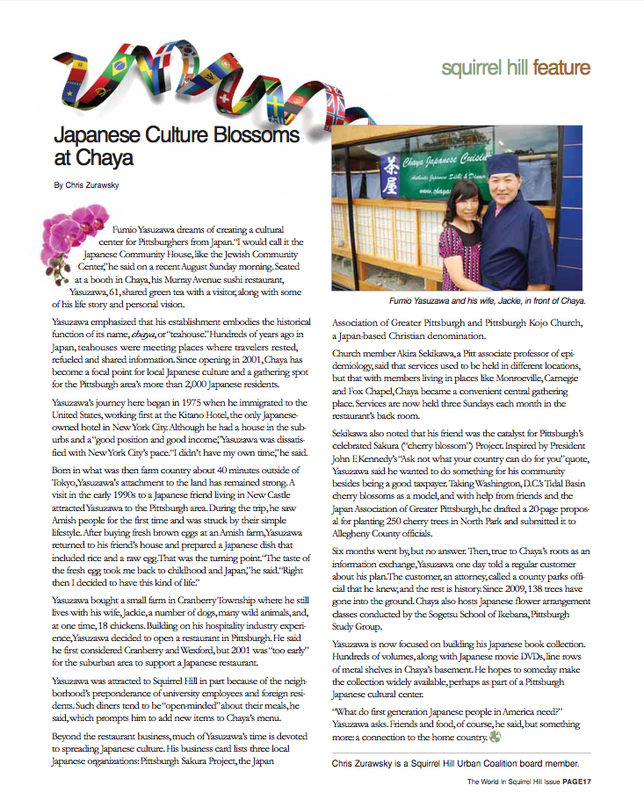 The Fall 2013 issue of the quarterly Squirrel Hill Magazine has a profile on Chaya, a restaurant on Murray Ave. considered by Japanese in Pittsburgh to have the best Japanese food in the city. In addition to the usual background information, the piece alludes to owner Fumio Yasuzawa's hobby of collecting material for a Japanese cultural center here. Yasuzawa is now focused on building his Japanese book collection. Hundreds of volumes, along with Japanese movie DVDs, line rows of metal shelves in Chaya’s basement. He hopes to someday make the collection widely available, perhaps as part of a Pittsburgh Japanese cultural center.